Recent racist incidents in two school districts underscore what one state official says is an increase in such incidents in Maine’s schools. Brandon Baldwin, who leads a civil rights team at the Maine Attorney General’s Office, said he’s had more reports of racism in Maine schools this year than any other time in his 12 years on the job. School officials provided few details on the incidents. In a letter to parents, RSU 21 Superintendent Katie Hawes said there were two “instances of hate speech and specifically racial discrimination” at the Middle School of the Kennebunks. One of the incidents was via social media, Hawes said in her letter, and the other occurred on a school bus. Hawes did not return calls Friday. 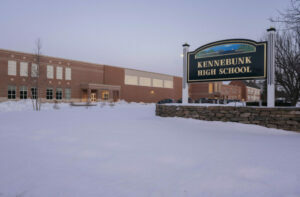 The incidents occurred after a former teacher with the district filed a complaint with the Maine Human Rights Commission, saying she was retaliated against after reporting racist incidents in 2016 and 2017 at Kennebunk High School. More than 200 residents turned out at a meeting in late February and called for action from the school board after the teacher’s complaint was reported. The district includes Arundel, Kennebunk and Kennebunkport. The district administers schools in Cumberland and North Yarmouth. In an interview, Porter said racial slurs and other “inappropriate language” were used in one face-to-face encounter among students and two slurs were made online. The district identified a student involved in one of the online incidents, but was unable to determine the identity or identities in the other case. Both students who were identified were disciplined, but Porter declined to provide specifics. Baldwin said both school districts contacted him after the incidents at their schools. He said he advises schools to treat the behavior as “bias-based harassment,” not bullying, and to make sure they focus at least as much time with targeted students and their families as with the student who committed the harassment. He also said schools need to determine if the incident is an isolated one, or part of a pattern. “Set the bar low in determining if this is a ‘bigger issue,’ ” Baldwin said in the material he sent to the schools. Other school districts say they haven’t seen an increase in racial incidents, but they are wary. Ken Kunin, the superintendent in South Portland, said his district’s administrators are constantly monitoring the hallways and social media for slurs and talking to students to find out if there’s an issue. “They will know what’s going on long before we do,” Kunin said. Kunin says the cause is the coarsening of debate in society. Kunin said South Portland schools focus on giving a voice to immigrants and students of color, encouraging them to talk about their experiences and how those have shaped them. “It’s harder to make people ‘the other’ when you know who they are,” he said. Nationally, hate speech or racial harassment complaints seem to be on the rise, although the data is often years old by the time it is compiled. For instance, more than 25 percent of students report hateful graffiti in their schools, and a majority of students who said they had been a target of hate speech said they attended suburban schools, a 2015 survey conducted by the U.S. Department of Justice found. And data compiled by the U.S. Department of Education said its Office for Civil Rights received 675 complaints about racial harassment in 2017. That was an increase of nearly 25 percent from the year before and the biggest climb in one year since 2009, the Huffington Post reported. The state Department of Education said it has received reports of 300 cases of bullying this school year, but it doesn’t break out those that are race-related and instead includes all reports of cyberbullying, verbal abuse or harassment in its database. The department provides model policies for dealing with those incidents, said spokeswoman Kelli Deveaux, and supports local efforts to investigate and address them. Porter said schools are often the places where hate speech or racism is dealt with, even if the incidents occur off school grounds and hours after classes end. That was the case with the two online incidents, but Porter said his district considers them school-related because they create disruption at school. In the case of the online slurs, “it was already disruptive at the beginning of the day” after it occurred, he said. “The high school students seemed to know of it very quickly” and some went to teachers and administrators to report it. “A lot of times these things do happen on social media and … (students) come in and are aware of what goes on. That’s when it creates a disruption and stir,” Porter said. The district needs to “create a conversation” about race, Porter said, particularly in a district that’s overwhelmingly white. He said part of that discussion needs to be about helping students to think of themselves as part of a global society and recognize “digital citizenship,” in which students need to take as much responsibility for what they say to someone in the seeming anonymity of the online world as they would if they were speaking to the person in public. “On social media, it’s more free to throw those slurs out there because there’s not a person in front of you,” he said. Porter said he’s “gotten a ton of emails” of support since sending out his letter Tuesday and he hopes to brainstorm with his school board, staff and students about more ways to address the problem. He noted that RSU 51 has a lot of international student exchanges and it might be smart to set up a similar program regionally to help broaden the outlook of students. Greely High School principal Chris Hoffman met with students this week and, in a Friday newsletter, encouraged parents to talk with their children about social media postings and review what they write and who they follow. Baldwin said a lack of diversity in the state can make it difficult for many Mainers to see the incidents as an issue. And, he said, the incidents may be spurred, at least in part, by a backlash to efforts to erase racial divisions.